SBI Clerk 2018 (Junior Associates) best Coaching Center Mentors in kerala SBI Clerk (Junior Associates) Exam is held by SBI or State Bank of India to recruit candidates for Clerical Cadre in its different branches across the country. SBI Clerk (Junior Associates) 2018 facilitates the recruitment for the post of Junior Associates (JA). SBI Clerk is one of the most sought after bank exams today and a huge number of candidates appear for the same every year. SBI Clerks (Junior Associates) are responsible for all the client interactions and related operations. Candidates who are recruited as SBI clerks are designated as cashiers, depositors and other posts that form the face of a particular SBI Bank branch. Here, in this article we talk about SBI Clerk 2018 Notification, Exam Dates, Pattern, Syllabus & more. SBI Clerk 2018 Notification The SBI Clerk (Junior Associates) 2018 Notification has been finally released by State Bank of India. Candidates can check the official notification by clicking on the link mentioned below. The online registration for SBI Clerk 2018 exam has started from 20th January 2018. The Online Application window closes on 10th February 2018. Total number of vacancies updated in the official notification for SBI Clerk (Junior Associates) 2018 is 8301. Changes for SBI Junior Associates 2018: As per the official notification released by SBI "No minimum qualifying marks for individual subjects are prescribed". Thus, there will not be any sectional cut off for this year's SBI Junior Associates Recruitment's Online Examination. However, the criteria solely lies within the hands of the organisation. Click to check SBI Clerk 2018 Official Notification Click Here to Apply Online for SBI Clerk 2018 SBI Clerk (Junior Associates) Exam Dates 2018 SBI Clerk (Junior Associates) 2018 Preliminary Examination is scheduled in the month of March-April 2018, while SBI Mains will be conducted on 12th May 2018. The notification for the prelims has been published by State Bank of India. Candidates must keep visiting this website regularly to stay updated about the important dates for SBI Clerk 2018 Exam. Events	Dates SBI Clerk 2018 Notification	19th January 2018 Start of SBI Clerk 2018 Online Application	20th January 2018 SBI Clerk 2018 Application Form Closes	10th February 2018 SBI Clerk 2018 Preliminary Exam	March-April 2018 SBI Clerk 2018 Mains Exam	12 May 2018 SBI Clerk (Junior Associates) 2018 Application The SBI Clerk (Junior Associates) 2018 application process has commenced from 20th January 2018. Candidates are required to visit the official page of SBI to fill in the online application forms as the entire process to apply for SBI Clerk 2018 exam will be online. The application fee for SBI Exam is Rs. 600/- for General category and Rs. 100/- for candidates belonging to SC/ST/OBC/PWD category. SBI Clerk 2018 Online Application SBI Clerk (Junior Associates) 2018 Selection Procedure For the selection to the post of Clerical Cadre through SBI Clerk (Junior Associates) 2018 exam, candidates are selected through two phases of exams- SBI Clerk Prelims and SBI Clerk Mains exam. It is compulsory for all candidates to clear both the phases to secure the appointment letter from SBI. SBI Clerk (Junior Associates) Eligibility Criteria The eligibility criteria of SBI Clerk 2018 exam is mainly about two pre-requisites: A candidate is required to be between 20-28 years to be eligible for SBI Clerk 2018 exam. He/shemust hold a valid degree in any discipline from a recognized university. A candidate is required to be: A citizen of India, A subject of Nepal, A subject of Bhutan, A Tibetan Refugee who came to India before 1st January 1962 with the intention of settling permanently in India or a person of Indian origin who migrated to India from Pakistan, Burma, Sri Lanka, Kenya, Uganda, United Republic of Tanzania, Zambia, Malawi, Zaire, Ethiopia, Vietnam and have the intention of settling permanently in India. Serial No. Category	Upper Age Limit 1	SC / ST	33 years 2	OBC	31 years 3	Person with disabilities (General)	38 years 4	Person with disabilities(SC /ST)	43 years 5	Person with disabilities(OBC)	41 years 6	Jammu & Kashmir Migrants	33 Years 7	Ex-Servicemen/Disabled Ex-Servicemen	Actual period of service rendered in defence services + 3 years, (8 years for Disabled Ex-servicemen belonging to SC/ST) subject to max. age of 50 years 8	Widows, Divorced women( No remarried)	GEN- 35 years OBC- 38 years SC/ST- 40 years SBI Clerk Exam Pattern 2018 To crack SBI Clerk (Junior Associates) 2018 exam it is very important to know the exam pattern in and out. Here is the exam pattern of SBI Clerk Prelims and SBI Clerk Mains exam: SBI Junior Associates Preliminary Exam Pattern Serial No. Section	No. of Question	Total Marks	Duration 1	English Language	30	30	20 minutes 2	Numerical Ability	35	35	20 minutes 3	Reasoning	35	35	20 minutes Total	100	100	60 minutes SBI Junior Associates Mains Exam Pattern Serial Number	Section	No. of Question	Total Marks	Duration 1. General English	40	40	35 minutes 2. Quantitative Aptitude	50	50	45 minutes 3. Reasoning Ability and Computer Aptitude	50	60	45 minutes 4. General/Financial Awareness	50	50	25 minutes Total	190	200	2 hours 40 minutes SBI Clerk Syllabus 2018 The syllabus for SBI Preliminary Exam and SBI Mains Exam is more or less the same with minute variation for SBI Clerk (Junior Associates) 2018 Exam. Candidates should have strong understanding of concepts in English Language, Quantitative Aptitude, Reasoning, Computer Knowledge and General Awareness. Quantitative Aptitude	Reasoning	Computer Knowledge	English	General Awareness Simplification	Machine Input/Output	Basics of computer, different generations, hardware/software, etc. Reading comprehension including Synonyms and Antonyms	Current Affairs – news on banking industry, awards and honors, books and authors, latest appointments, obituaries, new schemes of central and state governments, sports, etc. Number Series	Syllogism	DBMS	Sentence rearrangement or Para jumbles	Static GK - country-capital, country-currency, headquarters of financial organizations (of insurance companies), constituencies of ministers, dance forms, nuclear and thermal power stations, etc. Data Sufficiency	Blood Relation	Networking	Sentence Correction/ Error Finding	Banking/Financial terms Data Interpretation	Direction Sense	Internet	Spell Checks	Quadratic Equations	Inequalities	MS Office and Shortcuts used in MS Officers	Fillers	Time and Work	Puzzles – Seating Arrangement, Floor puzzle, etc. Input/output Devices, their types	Cloze Test	Partnership	Coding Decoding	Important abbreviations	Profit and Loss	Ranking	Mensuration	Statement and Assumptions /Conclusions	Time, Distance and Speed – Trains, Boats n Streams	Simple and Compound interest	Mixture and Alligation	Ratio and Proportion, Percentages, Averages	SBI Clerk 2018 Admit Card Registered candidates will be required to download BI Clerk Admit Card 2018 from the official website of State Bank of India. The hard copy of the SBI Clerk admit card won’t be couriered to applicants. The admit card for SBI Clerk Exam 2018 will be released in two stages - admit card for preliminary exam, the admit card for mains exam. One must login to his/her account created while filling in the online application form and download the admit card. To login on the official website of SBI, a candidate is supposed to have: Registration Number/Roll Number Date of Birth/Password The admit card for SBI Clerk 2018 exam will be issued to candidates in two phases: For Preliminary Exam (available tentatively from 1st March 2018) For Mains Exam (available tentatively from 26th April 2018) All candidates must go through the guidelines provided on the official website of SBI before downloading his/her admit card. SBI Clerk Result & Cut offs 2018 SBI Clerk Result 2018 will be declared once the both phases are concluded. SBI will publish results individually for both preliminary and mains exam. SBI Clerk 2018 releases sectional cut-offs for both – SBI Clerk Preliminary Exam and SBI Clerk Mains Exam. Aspirants are required to meet the cut-offs for all the sections to make it to the merit list. SBI Clerk 2016 Prelims Cut-Off SBI Clerk Cut off 2016 (Category Wise) Subjects	Total Marks	General	OBC/ST/SC/OH/VI/HI/DXS Reasoning Ability	35	7.75	3.25 Numerical Ability	35	5.5	2 English Language	30	6.75	3.25 SBI Clerk Cut off 2016 (State Wise) Candidate’s Category & Total Marks obtained in SBI Clerk 2016 exam out of 100 States	Gen	OBC	SC	ST	OH	VI	HI	XS	DXS Madhya Pradesh	54.75	54.75	36.5	9	36	12.75	14.25	11.75	19 Rajasthan	64.5	64.5	53.5	25.5	41.25	15.75	20.5	10.5	14.25 Uttar Pradesh	59	56.25	42.75	31.5	47.25	10.75	11.75	9.5	11.75 Himachal Pradesh	57.5	57	42.75	48.25	22.75	17.25	22.25	9.25	36.25 West Bengal	51.25	35.25	32	20.75	11	14.25	11.25	11.5	18.5 Maharashtra	51.5	51.5	51.5	24.5	39.5	55.75	14	11.25	23.75 Delhi /Haryana	66.25	50.75	56	10	Bihar	51.5	51.5	33.5	57.25	37	14.25	12	10.75	25.5 Punjab	67.5	56.5	45	45	Chhattisgarh	22.5	22.5	9.5	9.25	13	15	2.5	1.25	28.5 Gujarat	42	42	42	28	Uttarakhand	59.25	48.25	37.5	45.25	36.25	25.25	13.5	10.75	33.75 Tamil Nadu	21.25	21.25	21.25	21	11.75	15	9.5	9.75	15.25 NAGALAND	21.75	21.75	21.75	21.75	N/A	24.5	25	26.5	19.5 Andhra Pradesh	39.25	39.25	39.25	10	45.25	34	12.25	9	27.5 Jharkhand	38.5	38.5	31.5	29.25	11.25	11.75	10.5	11.25	31.75 SBI Clerk 2016 Mains Cut-off SBI Clerk Cut off 2016 (Category Wise) Subjects	Total Marks	GENERAL	SC/ST/OBC	OH/VI/HI/ XS/DXS General / Financial Awareness	50	13.5	9.5	3.25 General English	40	14.25	10.25	4.5 Quantitative Aptitude	50	14.5	11.25	6.5 Reasoning Ability & Computer Aptitude	60	24	19	11.25 SBI Clerk 2016 Mains Cut-off (State-wise) States	SC	ST	OBC	GEN	XS	OH	VI	HI	DXS Madhya Pradesh	100.75	76.25	122.75	130.25	60.00	100.75	96.50	63.00	- Uttar Pradesh	103.00	81.50	120.50	132.25	86.25	107.50	111.25	69.00	61.25 West Bengal	105.50	86.75	110.75	131.00	86.75	87.75	65.75	73.75	65.75 Bihar	98.25	80.50	123.00	130.25	76.50	103.75	101.00	60.50	62.50 Uttarakhand	102.25	105.50	116.75	133.50	69.75	106.00	107.25	66.50	86.00 Haryana	106.25	119.50	137.00	Gujarat	112.00	122.50	Telangana	123.25	Punjab	138.50	Maharashtra	123.50	Andhra Pradesh	128.50	Jharkhand	127.00	Himachal Pradesh	133.50	Nagaland	115.75	Karnataka	117.00	Kerala	135.75	Rajasthan	136.00	Tamil Nadu	132.00	Assam	124.50	Chandigarh	121.75	Got any product related queries? Write to us at support@adda247.com or log ticket at support.adda247.com IMPORTANT EXAMS IBPS PO 2017 IBPS CLERK 2017 IBPS RRB 2017 IBPS SO 2017 OICL SSC CGL 2017 SSC CHSL 2017 SSC MTS 2017 SSC JE 2017 SSC GD SBI PO 2017 SBI CLERK 2017 SBI SO 2017 BANK PO 2017 DSSSB 2017 NIACL 2017 SSC CPO 2017 SSC STENO 2017 FCI Exam 2017 LIC Exam 2017 NICL AO 2017 CTET 2017 IPPB 2017 Bank Clerk NVS RBI GRADE B 2017 RBI Assistant 2017 NABARD 2017 KVS POPULAR SEARCHES SSC COACHING IN DELHI SSC COACHING IN CHANDIGARH SSC COACHING IN JAIPUR SSC COACHING IN LUCKNOW SSC COACHING IN CHENNAI SSC COACHING IN BANGALORE SSC COACHING IN HYDERABAD SSC COACHING IN KANPUR SSC COACHING IN PATNA SSC COACHING IN BHOPAL BANK COACHING IN DELHI BANK COACHING IN HYDERABAD BANK COACHING IN KOLKATA BANK COACHING IN CHENNAI BANK COACHING IN BANGALORE BANK COACHING IN GUWAHATI BANK COACHING IN CHANDIGARH BANK COACHING IN JAIPUR BANK COACHING IN BHOPAL BANK COACHING IN PUNE Career Power Career Power Head Office Metis Eduventures Private Limited India A-2, 201-208, 2nd Floor, Pragati Deep Building, Plot No. 8, District Centre, Laxmi Nagar, Delhi-110092 Call Us (Mon to Sat 9:30AM to 6:30PM) +919069142412 Email : info@careerpower.in JOIN CLASSROOM PROGRAMME ONLINE COACHING ONLINE TEST SERIES E-BOOKS CORRESPONDENCE COURSES BECOME A FRANCHISEE ONLINE SUPPORT CAREERS MEDIA ABOUT US Important Links: INTERVIEW BATCHES BANKERS ADDA SSC ADDA ADDA 247 ba ca sa fb tw yt Career Power Franchise Program DOWNLOAD THE ADDA247 APP Adda 247 Get it on Google Play © 2017 Career Power. All rights reserved. 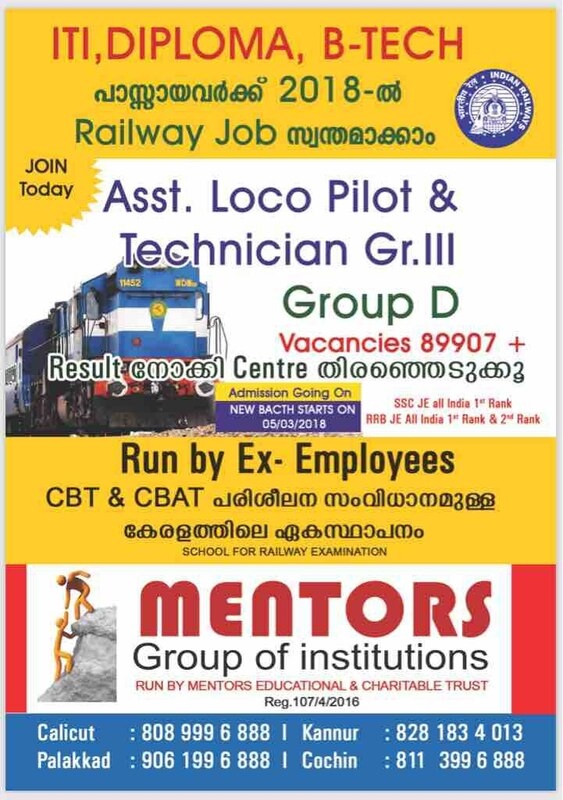 SSC Coaching Center Mentors kerala No.1 SSC COACHING CENTRE. IN Kerala SSC CHSL - 2017 60 DAYS CRASH COURSE (NEW BATCH) STARTS ON 27/12/2017 . SSC - CHSL ; SSC/ SSC JE /BANK LONG TERM ; RRB BATCHES STARTED.